Meringue (/məˈræŋ/, mə-RANG; French pronunciation: ​[məʁɛ̃ɡ]) is a type of dessert, often associated with French, Swiss, and Italian cuisine, made from whipped egg whites (or aquafaba) and sugar, and occasionally an acidic ingredient such as lemon, vinegar or cream of tartar. A binding agent such as salt, cornstarch or gelatin may also be added to the eggs. The addition of powdered sugar, which usually contains corn starch, to the uncooked meringue produces a pavlova. 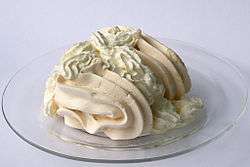 The key to the formation of a good meringue is the formation of stiff peaks by denaturing the protein ovalbumin (a protein in the egg whites) via mechanical shear. Meringues are often flavoured with vanilla, a small amount of almond, or coconut, although if extracts of these are used and are based on an oil infusion, an excess of fat from the oil may inhibit the egg whites from forming a foam. They are light, airy and sweet confections. Homemade meringues are often chewy and soft with a crisp exterior, although a uniform crisp texture may be achieved at home, whilst many commercial meringues are crisp throughout. It has been claimed that meringue was invented in the Swiss village of Meiringen and improved by an Italian chef named Gasparini in the 18th century. However this claim is contested; the Oxford English Dictionary states that the French word is of unknown origin. It is sure nevertheless that the name meringue for this confection first appeared in print in François Massialot's cookbook of 1692. The word meringue first appeared in English in 1706 in an English translation of Massialot's book. Two considerably earlier seventeenth-century English manuscript books of recipes give instructions for confections that are recognizable as meringue, though called "white biskit bread" in the book of recipes started in 1604 by Lady Eleanor Poole Fettiplace (c. 1570 – c. 1647) of Gloucestershire and called "pets" in the manuscript of collected recipes written by Lady Rachel Fane (1612/13–1680), of Knole, Kent. Slowly baked meringues are still referred to as "pets" in the Loire region of France due to their light and fluffy texture. French Meringue or basic meringue is the method best known to home cooks. 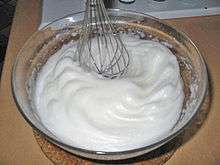 Fine white sugar (castor sugar) is beaten into egg whites. Italian Meringue is made with boiling sugar syrup, instead of caster sugar. This leads to a much more stable soft meringue which can be used in various pastries without collapsing. In an Italian meringue, a hot sugar syrup is whipped into softly whipped egg whites till stiff and until the meringue becomes cool. This type of meringue is safe to use without cooking. It will not deflate for a long while and can be either used for decoration on pie, or spread on a sheet or Baked Alaska base and baked. Pavlova is a meringue-based dessert and an icon of Australian and New Zealand cuisine. Meringues eaten like biscuits are baked at a very low heat for a long time. One name for them is "Forgotten Cookies" as they can be left in a gas oven for long periods of time after the cooking is done. They are not supposed to be "tanned" at all, but they need to be very crisp and dry. They will keep for at least a week if stored in an airtight container. Meringue can be used as the basis for various desserts including baked Alaska, dacquoise, Esterházy torte, Eton mess, floating island, key lime pie, Kyiv cake, lemon meringue pie, macarons, merveilleux, pavlova, Queen of Puddings, sans rival, silvana, Spanische Windtorte, and Zuger Kirschtorte. In some recipes, the meringue may be cooked at a higher temperature for a shorter amount of time, resulting in a soft meringue with slightly browned peaks on top. Another dish is "Meringue de Angel", which consists of shortbread biscuits layered with meringue and lemon curd, topped off with drizzled lemon glaze. Variations include raspberries, peaches, mangos, blueberries, blackberries, pineapple, papayas, honeydew, oranges, cantaloupe, or cherries and strawberries. Meringue may be used for embellishment. It can be formed into whimsical shapes, like mushrooms, or piped into a crisp basket that is baked and filled later with cake, fruit, or flowers. 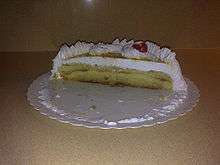 A meringue tart is a sponge cake covered with meringue. Meringue is a fat-free food, because the presence of even small amounts of fat before the meringue is baked causes the beaten egg whites to collapse. 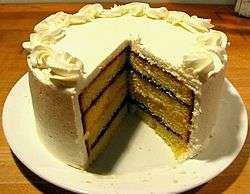 The principal nutritional components are protein from the egg whites and simple carbohydrates from the refined sugar. ↑ William R Trumble, Angus Stevenson, ed. (2002). "meringue". Shorter Oxford English Dictionary. 1 (fifth ed.). Oxford: Oxford University Press. p. 1751. ISBN 0-19-860575-7. ↑ "Meringue" (in German). Municipality of Meiringen. Retrieved 8 March 2013. ↑ Massialot, Nouvelle instruction pour les confitures, les liqueurs et les fruits, (Paris, Charles de Sercy), 1692, Chapitre XXVIII. Des Meringues & Macarons., pp. 186–188. noted by Muster (ref.). ↑ John Spurling produced a three-volume, typescript transcription of Lady Fettiplace’s book (Bristol:Stuart Press) 1994, noted by Muster (ref.). ↑ Cited in Michael Barry, Old English .Recipes, (Jarrod) 1995:64f from the manuscript archived at the Centre for Kentish Studies, Maidstone, Kent. ↑ Cf. Dr Barry Alcock in Caroline Jeremy (ed. ), Green & Black's Chocolate Recipes (Kyle Cathie Ltd), 2003:p.101. ↑ Ian Kelly, Cooking for Kings: the life of Antonin Carême the first celebrity chef, 2003:60, 225. ↑ Vega, César; Sanghvi, Avani (2012-02-14). "Cooking Literacy: Meringues as Culinary Scaffoldings". Food Biophysics. 7 (2): 103–113. doi:10.1007/s11483-011-9247-7. ISSN 1557-1858. ↑ "Meringue Cookies". Retrieved 2013-06-19. ↑ "Forgotten cookies recipe - Recipes". Retrieved 2013-06-19.